The Consolation of Counterfactuals: The Molinism of Boethius | J.W. Wartick -"Always Have a Reason"
One prominent challenge to molinism is the notion that such counterfactuals about future choices cannot exist or that God simply couldn’t know them. I was startled as I read Boethius’ (480-525 AD) work, The Consolation of Philosophy, to see that he had anticipated this objection and provided the outline of an answer to it about 1500 years ago. 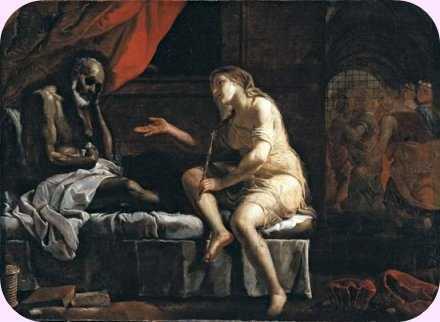 Boethius wrote the work as a dialog between himself and Philosophy, a woman who represented, well, philosophy. The last book focuses upon God’s foreknowledge and human freedom. Again, it was amazing to see that Boethius had anticipated an objection to molinism–a system of theological thought which hadn’t been conceived fully yet (and wouldn’t be for about 1100 years! )–and provided an answer. The objection was seen above: many modern philosophers and theologians contend that God could not know that which is not necessitated to happen. Before developing this argument, it is important to note that it rests squarely within Boethius’ later reflection upon the eternity of God–a being who has “the complete, simultaneous, and perfect possession of everlasting life” (Book V, section VI). Because Boethius holds that God is eternal in this sense–timeless–he can reasonably hold that God’s capacity to know is not limited by temporal constrictions. Thus, we get back to the nature of his response to the counterfactual objection to molinism. Boethius, holding that God is eternal and therefore not limited by time, grounds the knowledge of counterfactuals not in their own inherent ability to be known or not known, but rather in the ability of the knower to know them. It is worth emphasizing how radical and powerful this response is to the modern argument against molinism. If God is indeed timeless in the sense Boethius presses, then God would have access to the entirety of time as far as knowledge and action are concerned. Thus, by grounding knowledge not in the objects of knowledge themselves but in the capacity of the knower, Boethius grounded counterfactual knowledge. Now, modern opponents of molinism would take this in stride and argue either against the contention that God is timeless or against the contention that knowledge is based in the capacity of the knower rather than the known. Exploring either of these objections is beyond the scope of this post, but it is worth noting that Boethius’ rebuttal to the problem of counterfactual knowledge works if both of his contentions are true. The question is, of course, whether they are. Another way to attack Boethius’ defense of God’s knowledge of counterfactuals is to argue that even if it is the case that God is eternal and that His knowledge is grounded in the knower rather than the known, then it still would only mean that God knows what will happen, not what would happen if something were to happen. In other words, one could hold that Boethius’ answer doesn’t actually apply to counterfactual knowledge. It seems clear to me that there is much to develop yet in the objections and responses offered above. The last critique offered and my response certainly opens a number of areas of inquiry. However, for now it seems clear that Boethius has offered a unique way to look at the problem of counterfactual knowledge. Whether his perspective is correct remains a matter for further inquiry. Boethius offered a unique and stirring defense of molinism over a thousand years before it was fully articulated by Luis de Molina. It is worth looking into his answer, even if it fails, simply for the foresight it provided. But Boethius’ work is known as an astounding discussion of divine eternity as well, among other things. Thus, I encourage readers to look into his short work, The Consolation of Philosophy. Who knows, you may even find the consolation of counterfactuals therein. Edition Used: For this post I used the Penguin Classics edition of The Consolation of Philosophy (New York: Penguin, 1999). I find the key to be in the phrase “every situation”. Would that be very “conceivable” situation, or every “actual” situation? If every conceivable, then one could conceive of a situation where God makes an evil choice, and that He would therefore know the results of that. You can argue that in fact He does know, but then you are stuck defending God’s knowledge of an impossibility that we were able to conceive of. But then, this also exposes the flaw in another argument that Christian philosophers sometimes make: that we can only conceive of God because He exists. Yet, we can conceive of an evil God that doesn’t exist? And the One True God knows everything about him? Then how can an atheist know the difference? And so in fact, how can we? The idea of God knowing every “conceivable” situation therefore, whether true or not, strikes me as having very little use in explaining things. On the other hand, every “actual” situation is another matter entirely. My understanding of science and God has led me to point of conceiving the universe as a single 10-dimensional object, which we experience only a slice at a time along the 3 spatial and dimensions and 1 time dimension. God however sees all of the other dimensions that scientists can only demonstrate mathematically within the physical universe. Along the other dimensions lies the set of possibilities that I would say God has counterfactual knowledge for. Quantum mechanics argues that at the sub-molecular level, every possible state of an electron effectively exists simultaneously until you try and observe it. At that point, the electron has the state you tried to observe and has no other state than that. The difference between God and us is that He can observe the electron at every one of its possible states without the electron having to “make up its mind.” To whatever extent this can be said to result in alternate timelines at the macro level is scientifically uncertain, but God would know of them all, because they are all equally real. It just so happens that we can only perceive one real reality, and that’s it. At this point, I retreat to scripture. Christ died once for all for the remission of sins. It doesn’t say once per timeline, though I suppose such clarification may simply have been beyond the early church’s grasp. After all, God is a Trinity and God did not reveal that to the Israelites. I also believe the flood was local, and the words used for that can sound universal. But here’s the rub. Not comprehending everything about God or what He does is one thing. But there is only one God, and He only has one plan. I cannot accept that Christ died on more than one timeline within the universe, that I accepted Him more than once within the universe, or that there could be timelines in which perhaps I did not accept Him at all, because I would then have to conceive of the universe containing up to an infinite number of Mikes with the same spirit, or an infinite number of spirits who are equally Mike. From a scriptural perspective, I find such a proposition untenable. I am therefore reduced to believing that while our universe can in fact accommodate multiple timelines within it, and that God would in fact see them all, because they are all physically real, there is yet nothing that necessitates their existence, other than OUR ability to imagine them or an atheist’s distaste in a Christian retreating to God’s word. In conclusion, I believe that God has counterfactual knowledge to the degree that other actual situations exist on other timelines… there is simply only one timeline however, the one on which we live, the one on which Christ died for the remission of sins. As far as quantum mechanics are concerned, the existence of multiple states at the micro level in fact defines what we see at the singularly macro level. It turns out that the state of a molecule contains within it the multiple states of its composite micro particles. It seems counter-intuitive, but the laws of physics at that level only work within such a framework… all the micro-states exist as they define the single macro state in which we live. In other words, what might be counterfactual at the quantum level is consistent with the singularly factual of the macro level… regardless of the multitude of states one can in fact imagine, there is in fact only one true state, one true reality, and even from the perspective of outside the universe, then is only one timeline (scientific hypotheticals notwithstanding). Bottom line? From my perspective, there is no counterfactual knowledge for God to know. Thanks for your comment. I can’t respond as fully as I would like so I’m going to respond to two points I think are primary in your comment. 1) You seem to have conflated the notion of ‘conceivability’ with ‘possibility’ and that is a major problem through the first part of your comment. For example, saying God has counterfactual knowledge of every situation would entail that God knows about all possible situations, but I don’t see how that would entail knowledge of all conceivable situations. I think it is dubious as to whether one can really conceive of God committing an evil. 2) Regarding the existence of counterfactuals: I think that your use of quantum mechanics only works on certain interpretations of QM. Notwithstanding, I don’t see how your comments in this regard undermine the possibility of counterfactuals. I’m not sure we’re using the same operating notion of “counterfactual” when it comes to molinism. What I mean when I say counterfactual isn’t “contrary to fact” but rather those things entailed by “If… then…” statements. I think the distinction you offer between conceivability and possibility is a good one. The question is how to distinguish. If two people can agree on that, then I think a productive discussion is possible. However, I have had debates where the skeptic presents situations that are conceivable but impossible… if scripture is the meter of impossibility. They use no such meter however, considering God Himself to be impossible already. So, while I would certainly be willing to compromise with you on what is possible vs. conceivable for the sake our particular discussions, I am not sure how much it would aid in discussions with others who have different perspectives on the Bible. For your other pont, I am in fact using the “if… then… ” formulation in my head when I write my respeonse above. “If we observe quantum state A and not B, then from that point on, we will observe a universe that stems from state A and not B.” I considered going back to the Big Bang. There was a moment when the universe was too small for general mechanics to rule things, and everything was quantum… that is, every possible universe statistically speaking existed simultaneously. When the universe expanded to a certain size, it “made up its mind.” There is a theory in fact that every version of the universe did in fact end up existing at that point, but we can only perceive the version we ended up in, perhaps in part because we observe it… the paradox of QM. It then leaves open the question of how many of those other versions there actually are, and we just don’t perceive them along our dimensional orientation. But I am afraid these are tangential to my point. I think my main point is that I don’t see the witnessing tool that one can derive from an exploration of molinism. Perhaps I am unnecessarily limiting myself to a small group of intellectuals. That said, from what I believe to be God’s perspective, a perspective from outside the universe, the universe would appear to be a static object, with all choices already made, with our own common reality laid out along the space and time axes that we perceive. From that perspective there is no counterfactual knowledge. It’s all there in front of God, whether that be one reality or a billion. What me might call counterfactual knowledge is then relegated to a matter of perspective. But then, because Christ died once for all, that reduces the possibilities to just one anyway. So again, I am back to thinking there is no counterfactual knowledge to be had. I realize we can imagine such knowledge, and therefore so could God… is that the counterfactual knowledge molinism refers to? But then, I have trouble seeing the point of exploring it. Thanks for the numerous clarifications on your points. Regarding the notion of conceivability vs. impossibility: I think the molinist debate is firmly in the camp of theology. While it may have some impact on witness (more on that shortly), it is largely a theological debate and so I think it is safe to assume that we can adequately make these distinctions. Regarding the quantum universe. I think the interpretation you’re offering may be correct, but there are, to my knowledge 8-11 different interpretations of quantum mechanics which are all consistent with the science. I guess my point is I’m hesitant to extrapolate from any one of them to make certain statements. I remain skeptical of any of them, because I think for now our knowledge base just needs to grow. The math/science is there, but the interpretations diverge and they can each fit the data. Well I’m not 100% sure what background you’re coming from but certainly it can be a good witnessing tool. For example, if someone objects to Christianity on the grounds that it destroys human freedom and they feel they have experienced free choice, the molinist could respond by saying molinism preserves human freedom and divine providence. 1) God sees time all at once from His eternal perspective. 3) Therefore, there is no counterfactual knowledge. I don’t see how 3 would follow from 1 and 2. Furthermore, I deny 2. But the really big problem I see with this argument is that it forgets one of the main points of molinism (which I didn’t develop here), namely that there are three “moments” in God’s knowledge. The counterfactual knowledge is indeed before creation, and so it existed “before” (using this term for lack of any semantically better term) the knowledge of what does happen. Counterfactual knowledge is God’s “middle” knowledge, existing between God’s knowledge of necessary truths and God’s knowledge of the free, created world. So I think the really devastating counterpoint to what you’ve brought up here is the very theory of molinism itself is designed to show how such knowledge still exists. A scriptural argument: consider Deuteronomy 33:2, which tells of the judges in Heaven, from whom God came to give the Mosaic Law. If those are the same judges in Heaven that John saw put in place in Revelation 20:4-5, and are also mentioned in Jude 14-15, then it means that from God’s perspective, He was giving the Law to His Chosen people from a perspective that allowed martyrs from the Tribulation to see Him give it to them. In other words, there is exactly one Tribulation in the future of Deut. 33:2, and it’s the same singular future we have waiting for us now. It is even a future that Paul confirmed will happen in 1 Corinthians 16:2-3. With the future known already by God, and in fact influencing itself circularly through the Law of Moses and by extension the Cross, it paints a picture for me of a static universe that has no need for counterfactual knowledge, yet has our free will choices integrally sewn into its fabric. On the other hand, to look for free will in Counterfactual Knowledge can only rob us of it, because it means God saw the choices we’d make in another version of reality and decided He liked our choices in this reality better. This is a great post, and we’re privileged to have a person so keen on spelunking the ancient works for insights into today’s hot debates! My response to Boethius would be that you can argue for exhaustive knowledge of the Knower and still have the position that He does not know counterfactuals, in the same way that you can say God, though omniscient, does not know that black is white or that 1 = 2. If we frame every thing in terms of necessity (and contingency is only imaginary), then all counterfactuals have false antecedents. So while the relationships between the antecedents and the consequents may be “true,” the counterfactuals themselves are not “true” in the same ontological sense we usually mean when we discuss truth, and about which someone can have actual knowledge. Honestly, “true” relationships between antecedents and consequents should have a different name to avoid equivocation. Needless to say, this kind of framing rejects both middle knowledge *and* free knowledge, since the *particular* procession of God’s will is considered as necessary as God himself. I think I answered this rebuttal in the second to last section of the post. Do you have a response to my conjecture? Let’s grant “If z instead of x, then God knows z” that aforementioned “hypothetical truth” (that is, the consequent follows from the antecedent). The issue is that “z instead of x” is false, if we’re saying that x represents what has actually happened or will happen. Thus that counterfactual, while mantaining a “true” relationship between antecedent and consequent, does not actually tell us anything about whether God knows z or not.